The CNOOC and Shell Petrochemicals Company (CSPC) site in Dayawan, Huizhou, China produces 2.3 million t/y of products of many different kinds, both liquid and solid. Keeping track of the loading and unloading of 250 trucks daily and 60 ships per month, plus exports by pipeline, is a complex logistical task that is handled smoothly by a Movement Automation System (MAS) from Yokogawa. Managing today's complex business supply chains effectively requires both a robust system of operations management procedures and support for third-party logistics (3PL). Successful supply chain management (SCM) for lowest costs, efficient handling and quick delivery also depends on intelligent hardware that can connect seamlessly to high-level business systems such as enterprise resource planning (ERP) systems and the associated plant production systems. The growing popularity of 3PL places increasing emphasis on the cost reduction element of logistics, so that optimized logistics can contribute to the competitiveness of the business. In the petrochemical industry, with its diverse and complex production and distribution routes, robust SCM—from raw materials, through production, to distribution—is an important business driver for reducing unit cost. Figure 1 shows a typical business supply chain considered as a system. Logistics, which forms the largest part of this supply chain, is a significant opportunity to reduce costs through the use of appropriate software and hardware. Logistics costs account for about 12 percent of the world's GDP. The MAS forms the backbone of the site's logistics operations. Key factors for its success include the ability to handle the diversity and complexity of CSPC's logistics needs, and a seamless interface to the company's ERP system. distribution to customers via pipelines, trucks and ships. 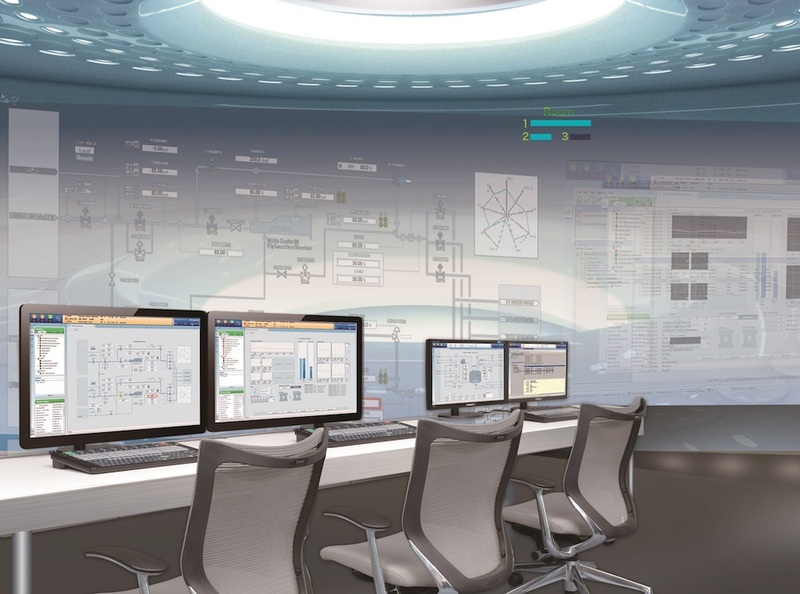 The Yokogawa MAS combines the duties of a management system and a control system. The main function of the management system, with its client/server architecture, is to support coordination and supervisory activities in the logistics business through its connections to CSPC's high-level ERP system. 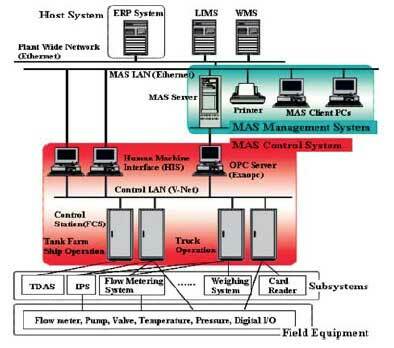 The control system used in the MAS is a Yokogawa distributed control system (DCS) which looks after the operational control and monitoring of product loading and unloading (Figure 2). The high reliability of this DCS—system availability is claimed to be 99.99999 percent—makes it the perfect choice for this critical task. Figure 3 shows the data flows within the MAS. At the front end, various sub-systems pass transaction data on to the MAS management system. Other sub-systems handle tasks such as process safety, pump signaling and meteorological information; these include the tankage data acquisition system (TDAS), custody transfer metering facilities and systems (CTMs), weighbridges, instrumented protection systems (IPS), fire and gas systems (FGS), intelligent motor control system (IMCS), and the meteorological system. The following sections show how these requirements were applied to the design of those parts of the MAS that control the movement of goods by road. With 250–300 trucks arriving every day, managing goods movements by road is a challenging task in itself. Some of the operating steps that apply to the goods that are moved by road are dealt with via manual procedures, but most of the bulk liquid loading and bulk polymer loading tasks are the responsibility of the MAS. To ensure security, access to the site by both vehicles and drivers is strictly controlled by the MAS. Each driver for an authorized carrier carries a permanent identity card. At the gate, the driver scans his identity card at a data entry unit (DEU). The MAS checks the driver's validity, looks up the order details, and passes back to the security guard on the gate the expected license number of the truck. If this matches the actual number on the license plate, the guard allows the driver onto the site. Other DEUs at the loading bays repeat the check of the driver's identity, and prevent product from being transferred if the details do not match. For special deliveries and late changes that cannot be handled via the carriers' ERP systems, transportation schedules are faxed to CSPC and entered into the MAS by hand. In all other cases, manual data entry is kept to a minimum to reduce labor and the chance of errors. 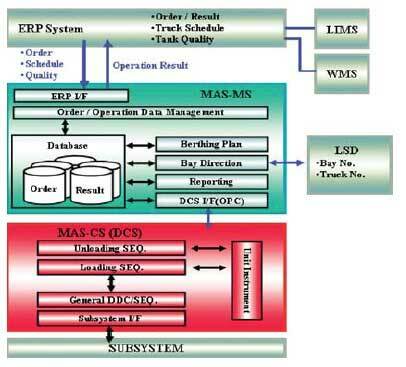 A truck scheduling module within the ERP, for instance, can download schedules to the MAS automatically whenever a large number of truck movements needs to be handled. The CSPC site has a total of 57 loading bays. To ensure that incoming trucks end up in the right place, four large screen displays (LSDs) in a parking area near the site entrance control the lines of trucks and direct them according to their license numbers. For liquids trucks, the MAS assigns the bays automatically. For solids, the warehouse management system (WMS) creates the bay assignments, which are then transferred via the ERP system to the MAS. As soon as the assigned loading bay is empty, the driver whose license number is at the top of the screen parks the truck within the bay and scans his identity card again. The loading or unloading process is then cleared to begin. When it is finished, the driver takes the truck out of the bay, and on the LSD display the next truck in line moves to the top of the screen. CSPC staff can monitor the status of the truck loading operation at all times. The complete automatic bay direction system, including the LSDs, plays a large part in the orderly management of road traffic on the site, with consequent savings in time, money and error rates. In today's fast-moving business climate, logistics plays an essential role in supply chain management, which in turn is an important part of the enterprise as a whole. Better logistics management can create big savings. The upfront investment in technology needed for a comprehensive MAS system is therefore worthwhile in terms of efficiency gains and a reduction in errors and rework. Designing the MAS requires a wellthought- out approach to the flow of business operations, and robust enterprise-level controls. For CSPC, the key factors were the ability to exchange information smoothly with the ERP system, the ability to coordinate logistics and provide supervisory support functions, and security.